Writing 6 exams in 4 days leaves little time to study, sleep, and eat properly. A year ago I’d probably find myself at Wendy’s grabbing a spicy chicken sandwich – but because a. fast food no longer agrees with my stomach, and b. I’m becoming more financially savvy, I’ve had to come up with my own version of fast food. One of my go-to meals? 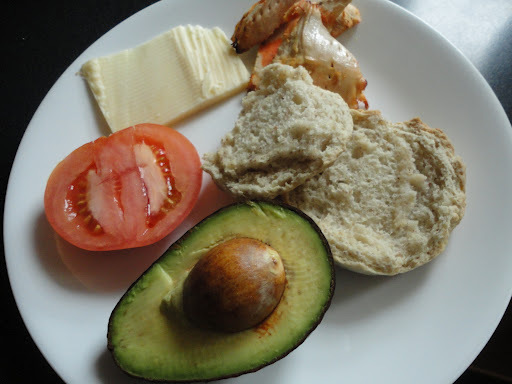 My chicken & avocado sandwich. Learn how to make it below! Instead of having fries on the side, I roasted some asparagus in the oven (drizzle some olive oil, sprinkle sea salt and ground pepper, cook at 350F for 12 minutes). Quick and delicious! Best thing about this recipe? It can be easily modified to fit your needs!